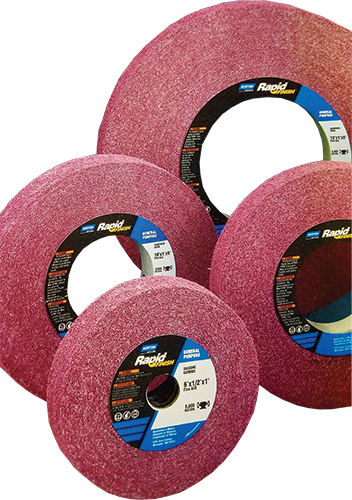 Norton Abrasives, Worcester, MA, introduced its color-coded RapidFinish nonwoven convolute wheels for finishing applications. The new wheels offer a 30-percent improvement in finish time as compared to previous wheels, thanks to a new grain/bond configuration, which also results in a 10 to 30-percent longer wheel life. The company’s patent-pending Norton Clean Bond technology reportedly delivers smear-free finish on a range of materials including high-nickel-content alloys and soft metals, thus eliminating rework and reducing finishing steps. To ease wheel selection, Norton Abrasives has color-coded the nonwoven material to applications and the fiberglass core (replacing the phenolic core to deliver improved concentricity while eliminating wear in wet applications) to abrasive grain.